In a small saute pan (or the large stock pot you’ll be using next) toast fenugreek, cumin and coriander seeds over medium heat, swirling around so they don’t burn. After a minute or two, when the seeds start to pop or become fragrant, transfer to a mortar or spice grinder. Grind spices, then stir in turmeric, and cayenne. In a large stock pot, heat oil over medium-high heat. Add onions, spice mixture, and some salt. As onion start to sweat, add mushrooms. Cook, stirring often, until lightly browned, 5 to 7 minutes. Meanwhile, mince ginger and garlic. Add ginger and garlic. Sizzle a few seconds. Add chicken and a little more salt, at your discretion. Cook, stirring often, 3 minutes, or until no longer pink on the outside. Add tomatoes and simmer, covered, about 8 minutes. Stir in spinach and simmer, covered, until wilted, about 3 minutes. Meanwhile, chop half a bunch or a large handful of cilantro. Stir into pot, along with lemon juice. Serve with cooked rice and cucumber raita. I’ve made this raita before with grated cucumbers, but here I wanted them in larger pieces for crunch. Cut cucumber in chunks. Add to a bowl along with all other ingredients. 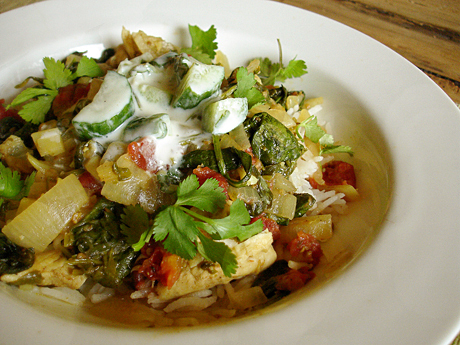 Keep chilled, then serve on top or to the side of Indian dishes, like the chicken one above. I’m going to try this soon!